Smoked salmon with avocado and cucumber salad. Zara was absolutely wonderful! Her food was so delicious and she went above and beyond at every opportunity to make sure our evening was as easy and as special as possible! Would recommend her to anyone!! Zara was very helpful since the first phone contact and accommodate the menu to the food restrictions ( gluten and dairy). She was friendly and professional and arrived early to have everything set for the dinner. The food was delicious and we had a very nice experience. It was also very easy and straight forward working with La Belle Assiette. I wouldn't hesitate recommending it. I hosted a 50th birthday dinner party for a group of 11 friends. Zara Richardson was our chef. We discussed the menu with Zara beforehand: tuna sashimi/ oriental salad starter; slow cooked beef, roast potatoes etc; pavolova. Zara was friendly, flexible with timings, very professional and critically the food was fabulous. My input was almost zero: Zara removed a huge part of the burden of hosting so I was able to relax and enjoy the time with my friends. The slow cooked beef was a particular stand out, but the whole meal met with generous praise. Zara left the kitchen in a clean and orderly state. I would recommend her unreservedly. I was not sure what to expect, but from the first phone call with Zara I was reassured. She was completely professional and entirely focussed on the food being absolutely right for us. We adapted the menu a couple of time and were never made to feel that this was a nuisance. The evening of our dinner party, Zara arrive din plenty of time, was very flexible when we had to change timing due the the late a arrival of one of the guests and, above all, presented beautiful and absolutely delicious food. We would book Zara again at the drop of a hat. Thank you. I was lucky enough to have Zara as my chef. She cooked for myself and 6 members of my family and I couldn't fault her at all. She arrived slightly early, was friendly, professional, very hard-working (I've never seen my kitchen so clean) and the food she cooked was outstanding. She even catered for my vegetarian niece, at the last minute as I forgot to mention her dietary requirements, and she wasn't phased at all and rustled up a delicious dinner for her in 10 minutes. Coupled with a temperamental oven, Zara was superb. I wouldn't hesitate to recommend Zara and La Belle Assiette to anyone. Zara was fantastic, she really helped make the night special. Her food was gorgeous and her personality was lovely, she made everything really relaxed and was happy to put the meal back by an hour as we were running late. We couldn't have asked for a nicer chef - the special touch of a surprise birthday cake was lovely too. We couldn't recommend her enough. We had a great time, Zara was very friendly and very professional. Everything was on time, and the food was delicious. I was worried about the quantity as we were a group of 8 men but when we finished eating the dishes were so full it looked like we hadnt started eating yet: it was a lot of quantity and it was delicious to eat the next day . I recommend Zara , and the experience in general. Food excellent, Zara was very easy to deal with and totally in control. All our guests loved the food. Fantastic chef, really personable and great food. Excellent. 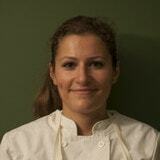 Zara is lovely, very friendly and appears to be totally calm in the kitchen. She was well organised and calmly got on with preparing the food once she had been shown the facilities. The food was absolutely divine! The service was great and the little additions of the champagne jelly and home-made mint chocolates rounded the meal off perfectly. A huge thank you to Zara for treating us to such a fabulous meal. It was all delicious, from the black pudding and quails egg canapes to the hand made truflles. My personal favourite being the lamb tortellini with butternut squash veloute. so tasty, I could have eaten that all night. I can only imagine how hard it must be to prepare a 3 course meal of such quality in a strange kitchen, but Zara did so calmly and with great charm. All this and a clean and tidy kitchen to finish. A perfect evening. Could she pop round every night? beautifully presented and flavoured food. Zara was professional and lovely, she really looks like she enjoys her job. A Masterchef experience for us both while I am recovering from major surgery. Luckily there were leftovers due to my small appetite- so I get to sample the food again today! Thanks from us both. Zara did a fabulous job. She was flexible to cater for a small child and her food was delicious. Specifically the thai curry. She was professional and friendly. Would highly recommend her and use her again going forward. Zara was amazing! She was well organised and prepared the menu we choose very well. She was very helpful in discussing and suggesting the menu beforehand. She's clean, professional and has a genuine passion for cooking! I would not hesitate to recommend her. Fresh and seasonal vegetables and herbs e.g. in spring fresh peas and broad beans, mint and basil. I love food! I've worked for some great restaurants and brilliant chefs. However, I was cooking for customers that I never met. I wanted to provide a personal service, working with my clients, tailoring my food to their wants and needs and therefore creating a very special experience. I get great pleasure from tasting wonderful dishes, the only thing that surpasses that is seeing a client get the same pleasure from a dish you have created. Be cooked for! I going to different restaurants and trying new things. If you believe this content violates or infringes your rights, Zara Richardson may not know. You could solve this problem by contacting him.